Every so often a film comes along and awakens something in its audience, something so visceral, so real and so utterly mesmeric that you are left wondering why there are not more films like it being made. As luck would have it, Julia Ducournau’s film Raw definitely falls in that category. This beautifully shot and brilliantly acted production made a big splash back in October 2016 when it was selected as part of the official competition at The London Film Festival. Ducournau went on to win the prestigious First Feature Competition prize, and the rest, as they say, is history. For the majority who missed it at LFF, the film is rightly getting a nationwide release, and judging by the interest it’s gathering, is sure to convert some new fans. Dealing with themes relating to female awakening, teenage angst, and feelings of alienation, Raw delves into the psyche of its female protagonists like no other film has done before. Shy and retiring Justine (Garance Marillier) is about to start veterinary school, just like her parents and her sister before her, she is completely unaware of what awaits her on campus. When she is subjected to severe hazing and is forced to perform all sorts of indecent initiation rites, something altogether sinister takes hold of the young woman, something that only her sister Alexia (Ella Rumpf), also a student at the school, is able to relate to. Soon strange things start to happen to Justine, things which will challenge her upbringing in a strict animal-loving vegetarian household. Ducournau follows in the long tradition of filmmakers making serious social and political commentary using horror as a catalyst for those themes. Fresh from the recent success of Jordan Peele‘s brilliant Get Out, it is refreshing to see a new generation of independent directors taking cues from the Carpenters and the Romeros who came before them, and making real, honest and believable horror films without resorting to cheap thrills. In Ducournau’s case, womanhood, or more precisely girlhood, is what is at the centre of her impressive work. Justine’s awakening is beautifully conveyed by Marillier whose turn as a young woman battling her inner demons, is beyond impressive. Her thirst for the unknown and her desire for flesh, carnal or otherwise, is what drives her to the brink. 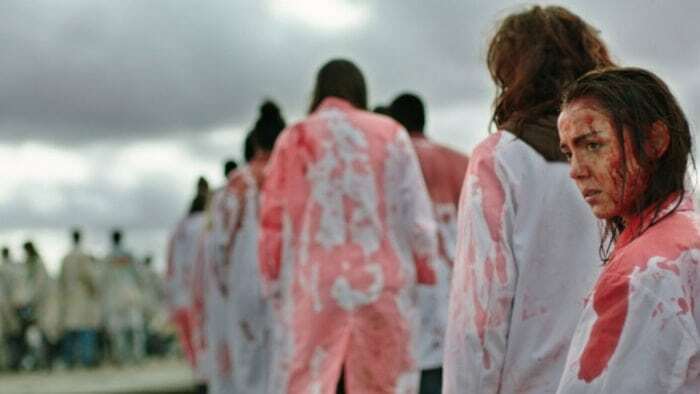 Hailed as one of the best horror movies to come out of France in the last decade, Raw manages to thrill, but it also offers its audience a classier, more sedate type of horror. Away from the usual tropes of jump-scares and easily forgettable storylines, films like Raw treat their audiences with the respect they deserve. Peppered with abundant use of Franglais and a killer soundtrack, Ducournau not only manages the impossible by making a film in French appeal to wider English speaking audiences, but she also gives young women a voice to talk about their innermost desires and fears. A beautifully written and superbly executed film and a real joy to watch, despite the odd gory detail. Raw is on general release from Friday April 7th.